Are you stuck in a rut with your guitar playing and feel like you are wasting your time? Searching Youtube endlessly for random information on guitar. Listening to friends or family that can “play the guitar” but can’t teach guitar. Wasting time and money on guitar books, and videos that have no strategy, no training. Working with untrained, uncertified guitar teachers that talk the whole lesson?! Getting so frustrated with your lack of progress on guitar that you want to quit! Teaching yourself leads to bad habits, loads of wasted practice, and overwhelm. Searching the internet endlessly for tips will never get you where you want to be. No online videos can assess your strengths, weaknesses, goals, and make a strategy for you. The fastest way to a goal is a straight line. Almost all guitar teachers took the trial and error approach in teaching guitar. Only an elite group of teachers know how to TRAIN students so they consistently become awesome guitar players. I struggled for a long time with switching chords, strumming, barre chords, soloing without getting stuck or hitting bad notes, learning all the scales and keys, training my ear and rhythm etc. I started focusing on the right skills in the right sequence and learned to link them altogether and started overcoming those challenges. This made practicing not only much more productive but way more fun! Since then, I committed to helping my students get over their guitar obstacles getting more from their guitar playing in less time. What Makes Me Different Than Other Teachers? I have studied master guitarists and teachers for years, refining my ability to train my students and keep them on the path to mastery. 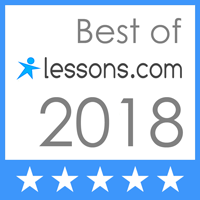 I am a member of the Elite Guitar Teachers Inner Circle and have FIVE Certifications in guitar training that I received at the Guitar Teacher Super Summit International (which no other guitar teacher in southern Massachusetts have.) I will not only care more, but give you the strategies, coach you, and never quit until you surpass your expectations. Q: I’ve tried guitar lessons before and it didn’t work. Why is this different? The teacher either did not know how to train you to crystallize your skills, or were just blindly teaching you information without any real plan. They probably piled on information and didn’t show you how to use it in real musical situations. Some music stores even have the philosophy of “the teacher should be one lesson ahead of the student.” This is music malpractice and is massively damaging to the student. Q: Will this work for me? I am 110% committed to helping my students exceed their expectations and will never stop training and pushing you. I will ensure that they never quit until they become the guitar player they want to be. Q:I’m really busy and I’m not sure if I can dedicate time to lessons? If you are thinking this then you can’t afford NOT to take lessons. If you are practicing and not getting anywhere, you must do something different if you want a different result. If you just learned how to organize your practicing and time better, you would get more results in less time. This will put time BACK INTO YOUR LIFE. Don’t look back in 5 years and wish you did something about it, TAKE ACTION NOW!